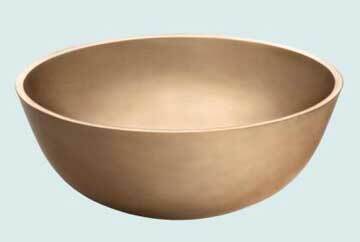 A simple round vessel in white bronze with a 1.75" flat rim that is thick. 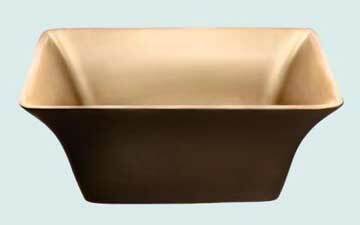 Heavy cast bronze basin more than 1/4" thick. Smooth with no pattern. 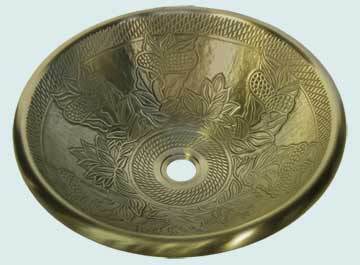 A decorative and moderately deep round vessel. The rounded top edge is smooth with a frosted look. Garden decor interior. Heavy cast bronze more than 1/4" thick. 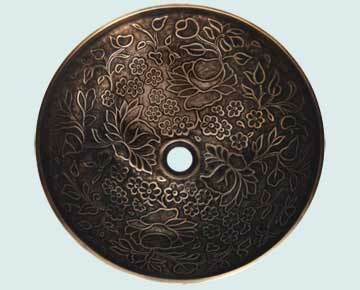 A delightfully decorative round vessel. The flat top is beveled and smooth. The floral detail is a favorite. Heavy cast bronze more than 1/4" thick. A decorative and moderately deep round vessel. The rounded top edge is smooth with a polished look. Vines & Leaves Detail on interior. Heavy cast bronze more than 1/4" thick. 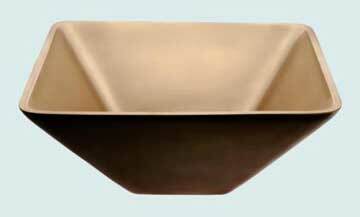 A simple rounded rectangle top edge with a fairly deep profile. Heavy cast bronze more than 1/4" thick. Square rimless top edge. This a Handcrafted Metal original design. 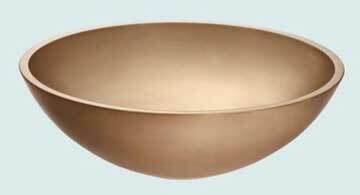 An oval top shape and graceful saddle top profile. Heavy cast bronze more than 1/4" thick. Square rimless top edge. This a Handcrafted Metal original design. 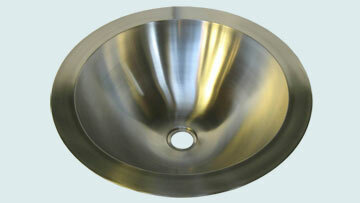 A very sleek, low profile round design with tapered top edge. Heavy cast bronze. This a Handcrafted Metal original design. Take advantage of this limited-time offer! The normal price for this is $530, but it's ON SALE NOW FOR $420! SAVE $110! 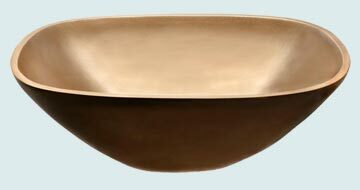 A round vessel with a deep bowl shape. Heavy cast bronze more than 1/4" thick. Top edge flares slightly outward, and is subtly canted toward the bowl. This a Handcrafted Metal original design. A classic conical shape with flat rimless top profile. Heavy cast bronze more than 1/4" thick. Top edge tapers to an eased edge. This a Handcrafted Metal original design. 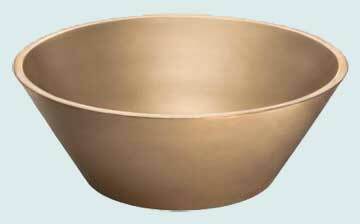 A moderately deep round vessel. The flat top edge has a very subtle outward taper. Heavy cast bronze more than 1/4" thick. Eased top edge. This a Handcrafted Metal original design. An inverted trapezoid shape with square top edge. Heavy cast bronze more than 1/4" thick. Rimless top has eased outside edge. This a Handcrafted Metal original design. Outswept curves give this rectangular vessel a French flavor. Heavy cast bronze more than 1/4" thick. Flat top edge, eased outside edge. 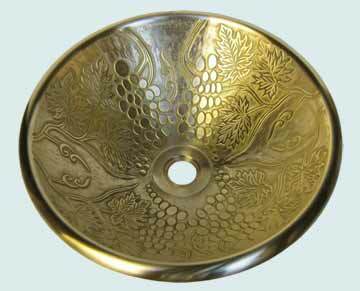 This a Handcrafted Metal original design. 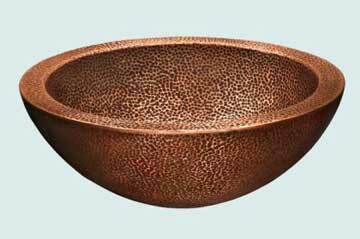 A simple round bowl shape with interesting hammered texture on the interior and exterior. Seamless double wall welded construction. Flat top rim is hammered and has eased outside edge.